By paulette1952, October 25, 2006 in INTRODUCE YOURSELF! Hi Crystel My husband was diagnosed only 5 weeks ago with lung cancer, it has now spread to his bones, he is only 58 I am devistated as i was hoping to have my 50th anniversary with him. We have been together for 40 years at christmas when i was 14. The prognosis is not good, doctors have told me only 6 months. I am trying to come to terms with it but it is hard, my husband thinks he is going to get better as he don't really understand how serious it is. My thoughts are with you all and your families. I'm so sorry to hear that your husband has been diagnosed... I am also suprised that the doctors are being so bleak and I would encourage you to encourage him to get a SECOND OPINION. There are MANY folks here who have been diagnosed with Stage IV LC, who with treatment, have even been able to thrive. I'm sure more will chime in. Keep posting and know that we care! And do think about that second opinion! Don't give up on that 50 year mark yet! Boy, you need to get your mind going in a different direction. There are folks here with lc spread to the bones and are doing pretty darn good. Statistics do not apply to your husband. But that will be a discussion for another time. You do not mention where you are. Most here will recommend that you get AT LEAST one other opinion before proceeding very far. Your doc sounds like he needs some refresher courses on how to deal with lc patients AND their loved ones. Hope is here. You must believe that there IS hope for your husband. Learn ALL you can. Inform us of exactly what has happened so far, tx recommended, etc., so all those who have walked in your shoes can help you. Take many deep breaths, start gathering your info. Be ready to be your husband's advocate and allow us to help you. Welcome-- I am glad you found us. It might be helpful to know where you are from to point you towards a second opinion. My husband was given 4 months over 4 years ago--- there are new drugs that can help. Get a doctor that will fight for you. Welcome, Paulette. I'm so sorry to hear about your husband's diagnosis, but you will see that we have a lot of Stage IV survivors here. Let us know how we can help. This site is full of patients in my situation who have no hope. This Macmillan site is for the patients who are all terminal, no survivors. It seems in the UK its the cost of lives not how to save lives at a cost. The drugs are probably not available to us as we have a health service here where we don't have to pay. It seems we need to get our priorities right here, and not have a system where we only get second class treatment, one for the rich and one for the poor. You can not believe the doctors they are not always right in their prognosis. I was diagnosed with stage IV lung cancer in July 2005 and was told that there was no cure. Three months later I was cancer free. There is not a cancer that someone has not beaten. You may want to get a second opinion and you need a doctor that thinks that he can cure you husband. Start planning on winning and how to do it. If I can be of any help let me know. You can go to the Tarceva web site for non US residents. You will find that Tarceva is approved in the United Kingdom. You probably can find out from them how you can get this in the UK this is one of the drugs that was used in my treatment. I have never heard of an oncologist not trying something. They really don’t know how it will work. They were amazed with the results I had. No reason why your husband can’t be amazed too. I am sorry about your husband's diagnosis but glad you have found this site. Unlike the one you spoke of in one of your posts here, this site is full of hope. I am not overly familiar with the UK's healthcare but there are several members on this site from the UK and perhaps they can be of more help to you? Never give up, as bleak as things sound, another dr might see this differently and be of more help and HOPE to you and your husband than the first. Please let us know how we can help you and keep us posted. We care! So sorry for all that you are going through. I see that you have already received some solid and inspiring advice from both care givers and survivors! I beleive that 90% of the battle is mental. If your husband beleives he will get better, then I beleive he will too! he is young, and he is not a number! Don't ever let anyone tell you how much time he has. Each day everyone of us gets out of bed it's 50-50 if we live or die. No exceptions! Get as many opinions as it takes to find a Doctor who is a fighter and up to date on new treatments and drugs. I am sorry that his doctor painted such a grim picture. There is always hope out there, you just have to find it. Go for a second opinion or a 3rd if need be. Do not listen to stasticts as so many on here were told the same as your husband. They got a treatment that worked and they are still here and doing fine. Sorry you had to find us. There are many people here who were given little hope, they found new doctors, and are doing really well! Do not give up. One doctor told my mom her chances were 50/50, either she makes it or not and to only focus on that stat. I'm familiar with the NHS is the UK. I do understand how hard it is to get the proper care there and depending on where you are treatments can be limited. There are others here from the UK who might be able to help you specifically. WHat I suggest is becoming your own medical advocate. Investigate the treatment options that are available (anywhere) for your husbands diagnosis and present your case to your doctors. It is my belief the squeeky wheel gets the oil and the more noise you make, perhaps he will soon receive the care he deserves. The media is quit prevelant in the UK as well, if my family member wasn't getting adequate care I'd start talking and I wouldn't stop until someone did something to shed light on what is happening. There IS alot of hope. Sometimes you have to seek it out, find other survivors, arm yourself with information- but there IS hope. Hang onto that, and on to us. We will be here for you. I am so, sorry about your husband's diagnosis. Please keep in mind that doctors have no idea about our "time" prior to diagnosis, or after diagnosis...don't lose hope, stay strong, and may you be granted peace. It tears me up inside to read about all the pain your husband is having. Please don't give up. I will be praying for you and your husband. 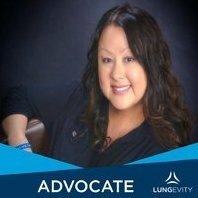 My husband was also diagnosed by 2 Dr's with stage 4 lung cancer and a third dx from UCLA (leading university medical center) is saying he may not have lung cancer. My prayers continue for you and your husband. I am so sorry about how much pain he is in. Could you speak to the doctor and try something different for the pain? I wish I could offer more... Please let us know how the scans go. Seven hours later from my last post its time to get mu husband up, he can't get up, he tries for an hour but the pain was too much, so i managed to get him on to his side and he ate his bit of toast what he takes with his morning pills. Its now 4 hours later I know he wants to go to the bathroom, but i still can't get him up, he says he will try again in an hour, that can't be good for him holding every thing up. I said i would call him some help but he refuses, he is now getting angry with me as he thinks i am trying to get him to go in the hospice, i want to keep him at home but only if he will take pain relief and help with getting him in and out of bed. There, I've now got it off my chest! !